We are getting into the season of beautiful beachy days here in Virginia, and it's almost time to start prepping those summery drinks and dusting off those perfect sunglasses. With that, I'm pumped to have Sara of Burnett's Boards sharing one of her favorite beach house wedding inspiration boards with us! 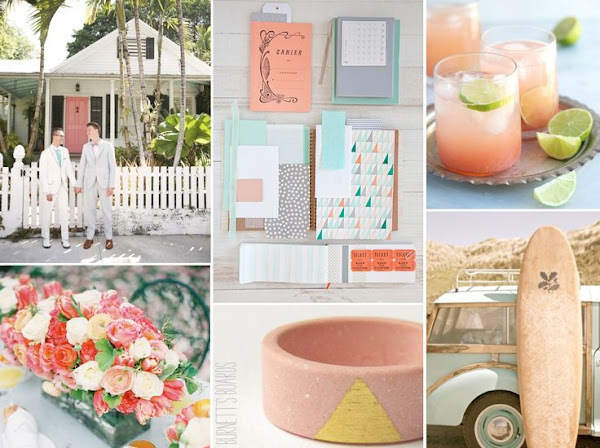 The subtly retro, but modern beach house vibe of this breezy coral wedding inspiration board gives a fun and summer theme to any casual couple. The colors gray, mint green, and gold are the perfect compliments to the pinky coral that still is very popular with beach wedding days. By using geometric elements in the stationery and even in your rings, you can add a gorgeous and unique trendy touch to any coastal theme. Don't forget the signature cocktail!